Before the formation of professional police forces, the military was used in Britain and its empire to deal with disorder and crime. In the penal colony of Van Diemen's Land, the military was also used as a police force to suppress violent bushrangers who terrorised settlers and plundered their property. Although this article argues that the military were crucial to imposing order in Van Diemen's Land, it also argues that the use of the military was problematic because soldiers and their officers challenged law and order, and sometimes committed crimes themselves as they had done in Britain and her colonies. 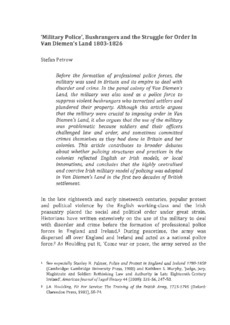 This article contributes to broader debates about whether policing structures and practices in the colonies reflected English or Irish models, or local innovations, and concludes that the highly centralised and coercive Irish military model of policing was adopted in Van Diemen's Land in the first two decades of British settlement.